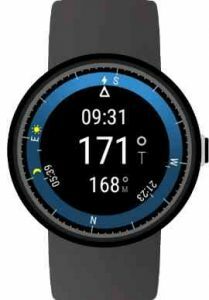 Compass for Wear OS : Compass with astro functions for Wear OS (was Android Wear) watches. This app can run as a normal app or watchface. Shows magnetic and true direction, current sun and moon direction, as well as sun and moon rise/set directions and times. The compass app is compatible with all Wear OS smart watches. If your watch doesn’t have a compass the astro functions will still work. If your watch is not listed, please check if your smartwatch runs Wear OS (former Android Wear). Simple design, like it. Works well on Ticwatch Sport. Don’t waste your time. This is a joke. It’s simply a face for your watch with no change when you move. If your smartwatch does not have a compass function the app will not work on your device. Please contact support@appfour.com if your smartwatch has a compass sensor but the app is not working properly after calibration. Thank you in advance, we will try to fix any issues asap!